In 1688 French Huguenot refugees, seeking religious freedom, began settling New Rochelle in the English Colony of New York. They met for worship that year in the rough-hewn timber home of the Guion family, the first residence in the village and the first place of worship. The French Protestant Reformed Parish was born. A minister arrived the next year and the first church building was constructed in 1692 near our current site. From about 1695, financial support for the clergy in this struggling community came from an English missionary society. In 1709 the Parish voted to join the Church of England and adopted the name of Trinity. After the American Revolution we became Trinity Episcopal Church, part of the new American branch of the Anglican Communion. Our current church building (the fourth on the site) opened for worship 150 years ago, on September 13, 1863. It was designed by Richard Upjohn, the architect of Trinity, Wall Street, in New York City. Envisioned as a center for Parish life and community outreach, our Parish House opened in 1892. Over a century later, we continue that outreach today in the Parish House with pre-school education, a whole rainbow of guest congregations, and lunches for the needy. With a merger in 1987, we became Trinity St. Paul’s, keeping our historic Trinity buildings. This Parish was founded by people from abroad looking for integrity in their faith and worship. Twenty-one years after its birth, this Parish affiliated with the Anglican Tradition, yet kept much of its unique character. Now, 325 years into our history, our congregation is made up largely of Anglicans who have come to the United States from other branches of the Anglican Communion, especially from the West Indies and from West Africa. The richness of our heritage includes the ancient faith, many times reformed. It includes the cultural gifts of Europe, Africa, and the Americas. We look back with gratitude for all that we have been given. We look ahead to the future generations who will worship and serve in this community of New Rochelle. 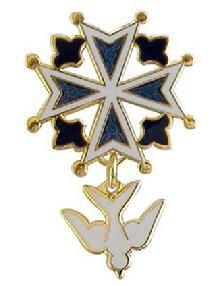 Design: The Huguenot Cross, courtesy of The Huguenot Society Website.